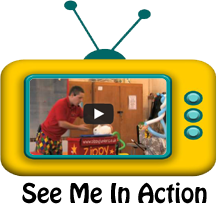 Zippy Junior is a full time professional children’s entertainer and clown in Middleton. He has been a professional entertainer for over 12 years and has established himself as one of the best entertainers in Middleton. His target age group is 2-8yrs. He is available for birthday parties in Middleton as well as christenings, weddings, school functions and carnivals. He uses a live rabbit in his magic shows and sometimes uses live doves. His most popular package is the 2hr stress free show. This includes a 45min magic show with lots of audience participation, followed by a disco with party games, dance routines, balloon modelling and circus skills. He also provides some small prizes in the 2hr show. This is perfect for christenings and birthday parties. Zippy Junior doesn’t dress up like a clown. He always maintains a focus on the birthday child and ensures to make them the star of the show. Zippy Junior is a well established kids entertainer in Middleton. He has PLI insurance, a CRB disclosure and all of his equipment is PAT tested. He covers the whole East Manchester area and is happy to travel further afield. Every booking comes with a written contract for your piece of mind. There is a small deposit to confirm the booking and then the balance on the day. Zippy Junior is very reliable and doesn’t sub the work out to other entertainers. If you book Zippy Junior, it will be him that turns up on the day. Zippy Junior is one of the most popular magicians in Middleton. He is available 7 days a week and can provide either a 1hr, 2hr or 3hr show. The most popular show is the 2hr stress free package.